You laid a heavy burden on our backs. but then You brought us relief. HEN natural disasters and other traumatic events occur, survivors, journalists, and relief workers can be overwhelmed with horrendous sights and smells and profound scenes of human suffering. But more often than not, in the midst of devastation and helplessness, these persons can do nothing more than cast weak sympathetic glances at each other, overlooking the greatest strength of all: complete trust in God. In psychological terms, though, the reality is that in our anger at God we confuse the psychological realm of the imaginary with the realm of the realand in so doing, we overlook the healing potential of the realm of the symbolic. For those not familiar with psychology, this needs some explanation, so follow along with me here. The Realm of the Imaginary derives from the pre-verbal state of childhood. As children, we needand desireothers to take care of our needs, but, without language, we conceive of this caretaking imaginally; that is, as images in our minds. Hence the realm of the imaginary is all in our heads, so to speak; its all based in the expectation that our needs should be fulfilled, and it provokes anger when our needs arent fulfilled. Now, when a parent takes care of a helpless infant, the caretaking can be an act of purerather than imaginarylove in which the parent is concerned only for the infants ultimate good. Once the child becomes capable of language and independent thought, however, caretaking can then fall back into the imaginary realm and degenerate into mere bribery, in which a parent gives only to manipulate the child with game playing and guilt into behaviors more suited to the parents comfort than the childs well-being. Although the realm of the imaginary begins in childhood, it persists even into adulthood. For example, the desire for romantic fulfillment in another person resides in the realm of the imaginary because romantic fulfillment depends on fantasies of someone giving you what makes you feel good. As hard as it is to admit it, and as much as it contradicts popular culture, romantic sentiment is based in self-indulgence, not in a selfless love for God. Furthermore, the pursuit of happiness, which characterizes secular culture (and corrupts Christian values) also belongs to the realm of the imaginary. Whether it be the happiness of drugs or alcohol or food or eroticism or athletic triumph or political triumph, it all points back to an infant yearning to be wrapped in unconscious bliss, seemingly protectedat least momentarilyfrom the reality of its own vulnerability. OK. So there is the realm of the imaginary. The world is generally quite stable. We go to bed at night and fully expect our slippers to be there, right where we left them the night before, when we wake up. Without this sense of stability we would be living in an Alice in Wonderland type of craziness. We couldnt function. Yet consider just how fragile this sense of daily security really is. 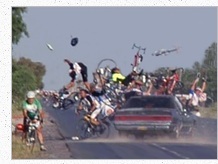 Any number of thingsfrom a car crash to an earthquakecould happen suddenly, without warning, and leave us in chaos. The Realm of the Real is therefore the place of our essential fragmentation, vulnerability, and death. Its the place where every disaster leaves us, wounded and helpless. Its our wretched reality. To most persons, the Realm of the Real is a terrifying place, and so most persons will do most anything to hide this reality from their own awareness. We try to live secure and peaceful lives in the moment while pushing away the knowledge that in the next moment everything and anything worldly that we rely uponour possessions and our bodiescan be wiped away. Psychologically, then, when you encounter the real you experience a shocking disruption of your previously secureand imaginarysense of self. Therefore, you will experience a trauma if you encounter the real with nothing but symptoms and defenses from the Imaginary Realm. In fact, the psychological function of a symptom is precisely to hide reality; a symptom hides an intangible and horrifying reality behind tangible mental and physical manifestations such as anxiety, insomnia, lethargy, nightmares, depressed mood, and so on. Furthermore, this encounter takes us right into all the psychological and spiritual dangers of blame. Consider here the story of Adam and Eve, which explains the concept of Original Sin. Adams part in this drama is seen most clearly not so much in his eating the forbidden fruit but in his pointing to Eve and saying to God, Its her fault! This woman you put here made me do it! In other words, instead of admitting his mistake and begging for forgiveness, Adam hid himself and blamed God; and we have been making excuses, hiding in sin, and blaming Godand blaming othersever since. “Why didn’t you stop them from abusing me? Why don’t you stop the wars? Why am I denied my rights? It’s not fair!” We blame God. We blame the government. We blame anyone who doesn’t give us what we want. In all blame, we hide from God. Yet in hiding from Him, we make it impossible to trust in Him. Well, full trust in God is composed of two separate but interrelated components: trust in Gods justice, and trust in Gods providence. Trust in Gods Justice. We have all encountered individuals who commit offenses and seem to get away with it. Although the irritation that we feel is justified, we can also be drawn into the desire to take matters into our own hands and get revenge. If we remember, however, that every crimeevery sinevery offense against lovethat a person commits is an offense against God that will be accounted for during his or her judgment at death, then we can understand that no one can evade Gods perfect justice. All sins will be paid for. If the sins are not repented, they will be paid for in hell, but if the sins are repented they will be paid for in Purgatory, thus demonstrating that mercy is a fundamental part of Gods justice. To trust in Gods justice, then, is to set aside our anger for the injuries inflicted on us and to let God administer His own justice according to His will. Trust in Gods Providence. Some individuals have the mistaken belief that trust in God means to sit around doing nothing in the expectation that God will do everything for us. But this false belief is based in an avoidance of our taking full responsibility for living holy lives that bear spiritual fruits. To trust in Gods providence, therefore, does not mean that we do nothing; it means that we believe that, in answer to our prayers, God will guide, protect, and encourage us as we take responsibility for developing and using our talents to serve God. The truth is, when bad things happen to you, that is reality. But when you set aside complaining and place yourself in Gods protection and voice your pain openly to God in prayerthat is, when you really trust in Godyou raise the Realm of the Real to the level of the Realm of the Symbolic. In the symbolic realm, the realm of language, horror can be given containment through the Word, thus allowing us to draw wisdom from pain and tragedy. will, in saving you, bring you back enduring joy. To find healing in the Realm of the Symbolic, though, it is necessary to leave behind our imaginary hopes. When Christ cried out these words from the cross, He was quoting the opening line of Psalm 22 to refer us to the entire psalm. There we find that what at first appears to be loss and failure actually results in the redemption of the entire world: For God has not spurned or disdained the misery of this poor wretch . . . the poor will eat their fill; those who seek the Lord will offer praise . 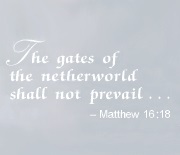 . . all the ends of the earth will worship and turn to the Lord. Through His obedient acceptance of the cross, Christ overcame death. The real cross, upon which Christ hung, is reality itself: the ingratitude and contempt that humanity inflicts on Gods love. The symbolic cross, upon which the Wordand our very destinyhangs, and which every Christian must embrace, is the spoken acknowledgment of our brokenness, trauma, and death that love alone can overcome. Christ offers us a share in the glory of His achievement if only we accept His call to follow the same pathif only we stop hiding the real behind empty defenses, if only we openly admit our pain to God, if only we let our prayer speak in honest humility for us. O Lord, my God, You are no stranger to those who do not estrange themselves from You. How can anyone say that it is You who absent Yourself? We should be grateful to the Lord our God, for putting us to the test, as He did our forefathers. Recall how He dealt with Abraham, and how He tried Isaac, and all that happened to Jacob in Syrian Mesopotamia while he was tending the flocks of Laban, his mothers brother. Not for vengeance did the Lord put them in the crucible to try their hearts, nor has He done so with us. It is by way of admonition that He chastises those who are close to Him. Be willing, therefore, to find the symbolic, spiritual meaning in tribulations, and then you can break the self-defeating cycle of blame and hatred. Whenever you pray for divine guidance, answers will come through encounters with mundane, daily events. 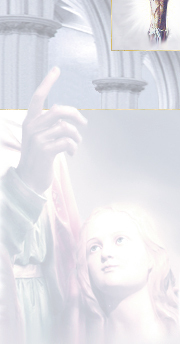 As these events occur, ask yourself, What is God trying to teach me in this? Let none of them pass as a mere “coincidence.” Seek their symbolic meaning, and open your mind and heart to what you need to learn about yourself through your encounter with the events, however troublingand grow in wisdom rather than stew in resentment. If your response is, Yeah, right. God is telling me that He hates me and that Im just a piece of garbage! then your sarcasm reveals the depth of your anger at your parents, the magnitude of your resentment of others, and the pervasiveness of your unconscious tendency to turn that anger against yourself in repeated self-sabotage. Truly, its far easier to say that God hates you, as an excuse for your hating others, than it is to listen to the depths of your pain and sadness and, in the process, open your heart to genuine love. Do I hide my emotional hurt behind a show of anger and a thirst for revenge? If so, maybe your psychological and spiritual task is to face up to and admit your hidden emotions. Do I use pride as a way to hide my feelings of vulnerability? If so, maybe your psychological and spiritual task is to set aside your pride and stop thinking so much about yourself. Am I harboring an attitude of resistance to authority? If so, maybe your psychological and spiritual task is to admit that this defiant attitude, which results from hidden anger at your parents, has been crippling you all your life. Do I lack patience? If so, maybe your psychological and spiritual task is to admit that, even though you think you live a devout life, your faith is all in your head and you dont really have much genuine love for others. 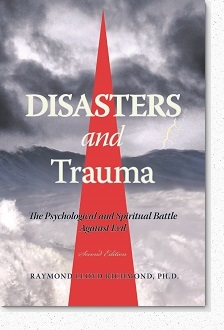 Disasters and Trauma by Raymond Lloyd Richmond, Ph.D. explains how an event is traumatic because it disrupts your previously secure sense of self. Wild animals live with a constant, sharp awareness of perpetual danger, yet most people live with a naive—and deceptive—sense of safety and security to the point of denying their basic vulnerability and fragmented sense of self. So when something disastrous happens, the psychological damage from the shattering of your illusions about life and identity may be more problematic than any physical damage.